The JSViewer_Angular(Core) sample demonstrates the use of the GrapeCity ActiveReports JS Viewer with an Angular 7 app and ASP.NET Core back-end. Visual Studio 2017 (https://visualstudio.microsoft.com/vs/) version 15.7 or newer. .NET Core 2.1 SDK or later installed on your machine. .NET Core Hosting Bundle](https://docs.microsoft.com/en-us/aspnet/core/host-and-deploy/iis/index?view=aspnetcore-2.1#install-the-net-core-hosting-bundle) (for deployment to IIS). Angular requires the Node.js 8.x or 10.x version. 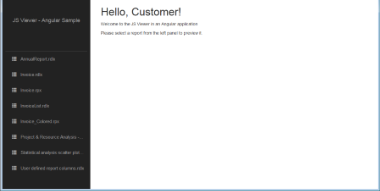 When you run the sample, the default page appears in your browser. 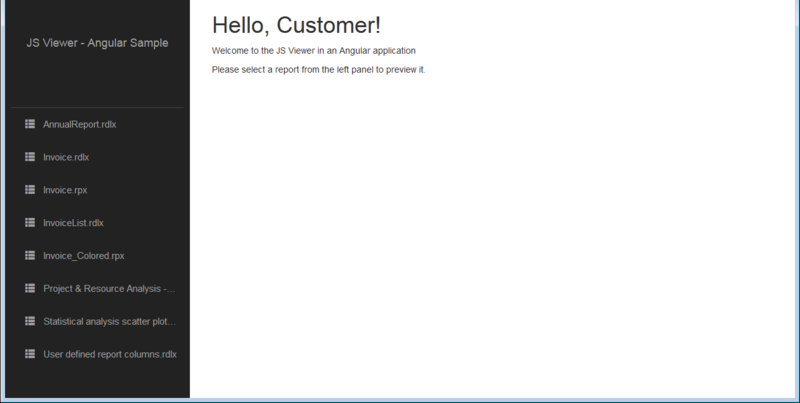 This page provides links to reports that demonstrate the use of the GrapeCity ActiveReports JS Viewer with an Angular 7 app and ASP.NET Core back-end. Clicking the report link in the left panel opens the report for preview. You can preview the following reports. The project consists of the following elements. ClientApp folder: This folder contains a standard Angular CLI app that is used for all UI concerns. Controllers folder: This folder contains the ReportsController files. The ReportsController handles the interaction with reports when a report is selected in the left panel. appsettings.json: The json configuration file. readme: This file contains the instructions on how to run the sample project. Startup.cs: This is the default startup file. Web.config: This configuration file contains the httpHandlers that allow ActiveReports to process reports on the Web. Note that you need to manually update version information here when you update your version of ActiveReports. Before publishing the sample, you must do the following. In the JSViewer_Angular(Core).csproj file, set the PublishToIIS property to true as follows: <PublishToIIS>true</PublishToIIS>. Copy the sample ViewerApp folder to the publish folder.